This cleaner is amazing on boat seats. I can not tell you how many mildew cleaners I have used over the many many years but, WOW! This is amazing ....I seen it on Utube and decided to give it a try after wavering a bit on the price. Most of the mildew dissipated after a minute the few remaining tough stains just came off with a sponge that had a scouring pad on the other side. I did not have to scrub hard or long! Now...after seeing how little I had to use and how "great" it worked...the price was very fair! Ordered product after watching a compelling video on YouTube. When product arrived it smelled just like laundry bleach. Tried product on a few different mildew stains and it did not remove stains. Did bleach color out of rag used. Scrubbing bubbles bathroom cleaner was more effective on the mildew and cost 75% less. Stuff works wonders. Took me all of 20 seconds to clean my boat seats this good. Worth every penny!!!! I was worried about replacing seats but this stuff brought them back to life!!! I own a 1996 Shoalwater and the cushion had heavy mildew. I was considering having them all replaced. 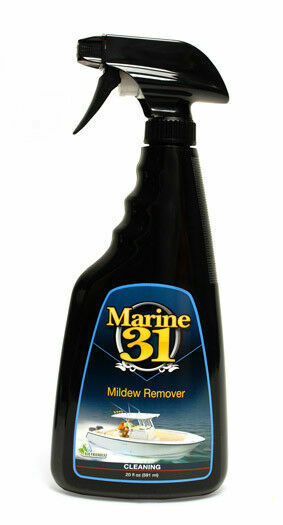 I did a search for a mildew remover and found Marine 31. I sprayed it on and did a light scrub and to my surprise after a wipe down with a towel the cushions came out good as new saving me hundreds of dollars. I highly recommend Marine 31! Best mold remover I've ever used, other that pure bleach and not as harmful! !